King cobras live mainly in the rain forests and plains of India and Southeast Asia. They are comfortable in the trees, on land and in water, feeding mostly on other snakes with the rat snake being their preference. King cobras can reach 18 feet in length, making them the longest of all venomous snakes. Fortunately for us, they are reclusive creatures that will make every attempt to avoid humans. When confronted, though, a king cobra transforms into a lethal adversary. It can raise a third of its body straight off the ground, looking the average person directly in the eyes, and still advance forward to attack. The intimidating snake will flare out its iconic hood and produce a frightening hiss that sounds a lot like a dog's growl. A single bite contains enough venom to bring down an elephant. Scientists are just now beginning to understand how intelligent these snakes really are. 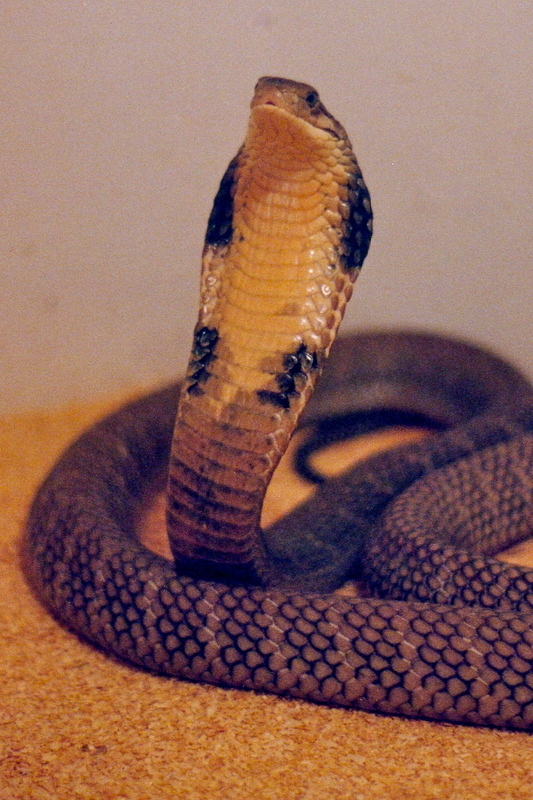 The king cobra is believed to possess exceptional memory. According to a myth, the picture of the killer of a king cobra stays in the eyes of the dead snake, that frozen image is later memorized by the snake's partner and is used to hunt down that killer for revenge. Wow, I would not go against that myth if I were the partner of the killer of a king cobra! What a facinating post. I enjoyed it thoroughly! Thanks, that's probably a good idea. I don't think you'd want to go up against one of these lethal snakes. I grew up in Western Nebraska and had lots of encounters with rattlesnakes but confronting a King Cobra would be a whole different level. That snake can raise up and look you in the eye and it growls like a dog. That's a scary snake. That myth at the end is a bit unsettling, but very memorable! I got this picture at a reptile sanctuary and I've researched a bit about them. There are some amazing facts and myths about the King Cobra but the main thing I learned is that if you ever encounter one of these snakes it's probably best to just leave it alone. You don't want to mess with a King Cobra. I was unaware King Cobra hit eighteen feet. I guess I've always seen them coiled. That is... way too long for what's essentially a rope that bites you. Yeah, I guess they can reach 18 feet long and raise up 6 feet high in the air. That would scare the heck out of me. Just a quick (belated) note - when the Buddha was sitting under the Bo Tree in his last stages of enlightenment, the Furies attacked him and were about to send a bolt of lightning to strike the Buddha down dead. The KIng Cobra emerged from the shadows and offered the Buddha its hood for protection. That which can kill can also cure. So interesting about its memory! I'll leave them alone thank you! Yeah, what I learned about them is that they try and avoid humans but if confronted it's probably best to just leave them alone.